Apply PowerShell Desired State configurations to a VM with the DSC extension for Linux. For more information, see Azure Desired State configuration extension. Configure monitoring of a VM with the Microsoft Monitoring Agent VM extension. For more information, see How to monitor a Linux VM. Configure monitoring of your Azure infrastructure with the Chef or Datadog extension. For more information, see the Chef docs or Datadog blog. 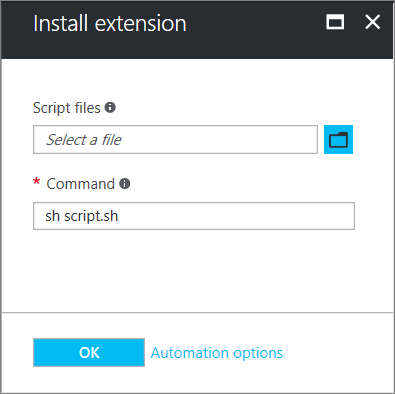 In addition to process-specific extensions, a Custom Script extension is available for both Windows and Linux virtual machines. The Custom Script extension for Linux allows any Bash script to be run on a VM. Custom scripts are useful for designing Azure deployments that require configuration beyond what native Azure tooling can provide. For more information, see Linux VM Custom Script extension. To handle the extension on the VM, you need the Azure Linux Agent installed. Some individual extensions have prerequisites, such as access to resources or dependencies. The Azure VM agent manages interactions between an Azure VM and the Azure fabric controller. The VM agent is responsible for many functional aspects of deploying and managing Azure VMs, including running VM extensions. The Azure VM agent is preinstalled on Azure Marketplace images, and can be installed manually on supported operating systems. The Azure VM Agent for Linux is known as the Linux agent. The Linux agent runs on multiple OSes, however the extensions framework has a limit for the OSes that extensions. For more information, see this article. To redirect agent traffic requests, the Linux Agent has proxy server support. However, this proxy server support does not apply extensions. You must configure each individual extension to work with a proxy. + Looking up the VM "myVM"
+ Installing extension "CustomScript", VM: "mvVM"
VM extensions can be added to an Azure Resource Manager template and executed with the deployment of the template. When you deploy an extension with a template, you can create fully configured Azure deployments. For example, the following JSON is taken from a Resource Manager template that deploys a set of load-balanced VMs and an Azure SQL database, then installs a .NET Core application on each VM. The VM extension takes care of the software installation. "commandToExecute": "[concat('sudo sh config-music.sh ',variables('musicStoreSqlName'), ' ', parameters('adminUsername'), ' ', parameters('sqlAdminPassword'))]"
For more information on creating Resource Manager templates, see Authoring Azure Resource Manager templates. The Linux VM Agent contains Provisioning Agent Code and Extension Handling code in one package, which cannot be separated. You can disable the Provisioning Agent when you want to provision on Azure using cloud-init. To do this, see using cloud-init. Supported versions of the Agents can use automatic updates. The only code that can be updated is the Extension Handling code, not the provisioning code. The Provisioning Agent code is run-once code. When the agent is installed, a parent daemon is created. This parent then spawns a child process that is used to handle extensions. If an update is available for the agent, it is downloaded, the parent stops the child process, upgrades it, then restarts it. Should there be a problem with the update, the parent process rolls back to the previous child version. The parent process cannot be auto updated. The parent can only be updated by a distro package update. The 'Goal state agent' is the auto update version. It is highly recommended that you always have auto update for the agent, AutoUpdate.Enabled=y. Not having this enabled means you need to keep manually updating the agent, and not get bug and security fixes. To see when an update to the extension occurred, review the agent logs on the VM at /var/log/waagent.log. 2017/08/14 20:21:57 LinuxAzureDiagnostic started to handle. To perform its tasks, the agent needs to run as root. Check extension-specific documentation troubleshooting sections for error codes, known issues etc.